The Firefox web browser offers options to customize its functionality with additional toolbar buttons. This is achieved by clicking on View > Toolbars > Customize in the menu. The available toolbar buttons usually add faster access to Firefox features. It is for instance possible to add a Print, Downloads or History button to a toolbar to access those features faster. 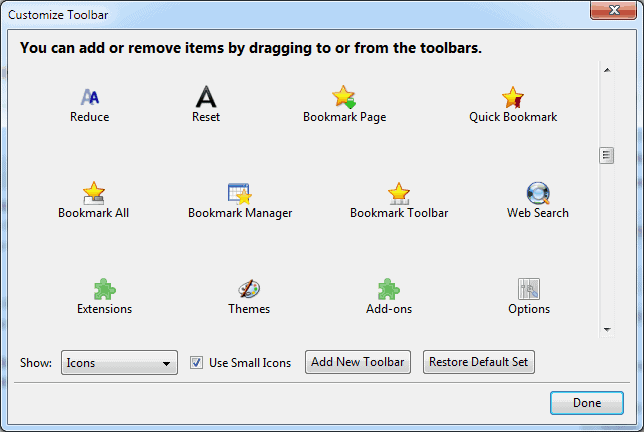 The selection of toolbar buttons is limited, there is for instance no option to link specific Firefox features that are not available as default buttons as additional buttons. The Firefox add-on Toolbar Buttons changes that. 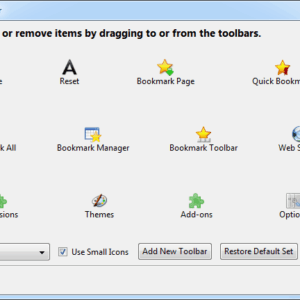 Toolbar Buttons installs dozens of new functional buttons in the Customize Toolbar menu. Each new button is added to the browser by dragging and dropping it to the desired location. Buttons for instance offer quick access to the extensions, themes and bookmark manager, but also to on-page functionality like increasing or reducing the font size, toggling images, proxies or cookies, and navigating to the top or bottom of the screen. The extension is not only compatible with Firefox, but also with Thunderbird, Flock and Sunbird. Using some of the provided buttons can improve the workflow noticeably. Advanced users and developers can for instance add a button to open about:config directly, add a toolbar bookmark menu button to save space on the toolbar or a profile button to open the profile directory by pressing the button. Yes, I mentioned that in the article. But you can probably force compatibility. I will be updating to install into the beta soon. However it does work fine for most buttons if you force it to install. The developer works hard at maintaining his add-ons. He’s no doubt waiting to update his to be compatible with Firefox 4 until there’s a final release or close to it since there are more than likely going to be more changes coming. If you don’t want all of the toolbar buttons provided, you can pick and choose just the ones that you want here.